Now with SSD. The Satellite offers everything that an all-round multimedia notebook should: Alongside a Core i7 processor, the device is equipped with a graphics core powerful enough to render games and a fast solid state drive. An IPS display with stable viewing angles also joins the ranks. But at almost 900 Euros (~$1100), this is no budget device. We wrote a comprehensive review of the Satellite L50-B just a few months ago. 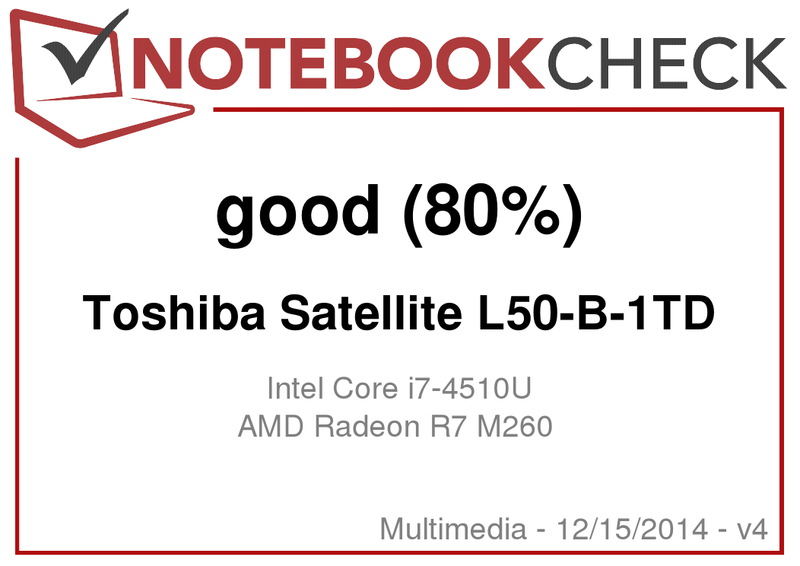 Toshiba's all-round multimedia notebook was able to secure a "Good" (80%) in our tests. Now we get to examine a new model -- the Satellite L50-B-1TD. This device is outfitted with a somewhat quicker Core i7 processor and a solid state drive. When all is said and done, is the Satellite L50-B worth buying? Read our review to find out. In essence, all 15.6-inch all-round multimedia notebooks count as the Satellite's competitors. Examples include the Dell Inspiron 15-5547, the HP Pavilion 15-p008ng, the Acer Aspire V5-573G and the Lenovo IdeaPad Z50-70. Because the two Satellite models are structurally identical, we won't cover the case, connectivity, input devices or speakers in this article. Information on these subjects is available in our review of the Satellite L50-B-182. Like its sister model, the L50-B-182, the Satellite L50-B-1TD is equipped with a glossy Full HD display. The screen's brightness (299 cd/m²) is good. Its contrast (554:1) and black value (0.54 cd/m²) are decent. Even so, the L50-B-182 trumps our test device's panel in all three of these areas (brightness: 340.2 cd/m²; contrast: 1024:1; black value: 0.31 cd/m²). Out of the factory, the display's average DeltaE 2000 deviation is 5.96 -- a good number. A deviation of less than 3 is ideal. The Satellite in outdoor use. Toshiba outfitted their Satellite with an IPS panel. One of the hallmark characteristics of displays of this type is their stable viewing angles. The screen content is visible from every direction. However, the Satellite isn't really cut out for outdoor use. In general, the highly reflective display makes reading the screen under the bright sunlight very difficult. 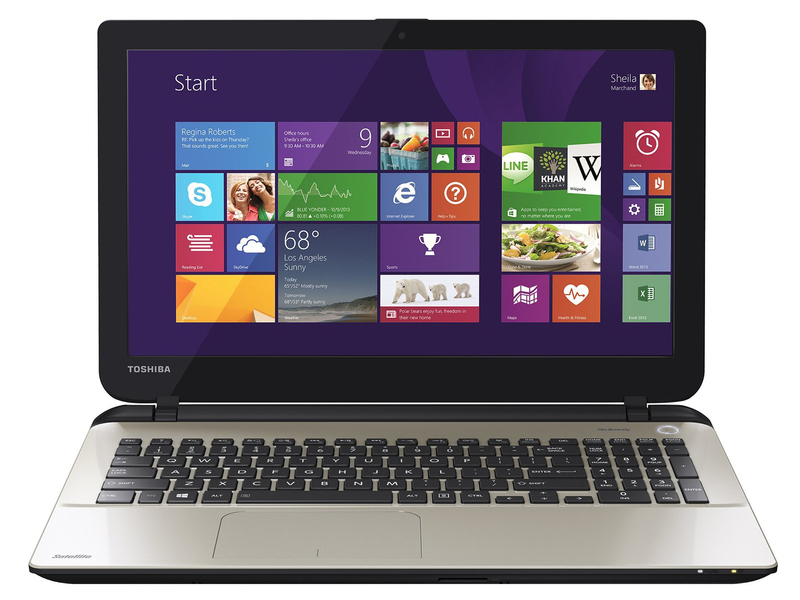 The Toshiba Satellite L50-B-1TD is a 15.6-inch all-round multimedia notebook. For everyday use, the computer's performance is more than sufficient. Current 3D games are also playable on this machine, to a limited extent. Our test device is available right now for just under 900 Euros (~$1100). Within the Satellite L50-B line, Toshiba also offers innumerable versions with a diversity of hardware. Thanks to its Core i7-4510U dual-core processor, the Satellite isn't lacking in computational power. The CPU runs at a base clock speed of 2 GHz. Using turbo, the speed can be increased to up to 2.8 GHz (both cores) or 3.1 GHz (only one core). This energy-efficient ULV processor has a TDP of 15 Watts. In AC power mode, the CPU is able to utilize its full performance capacity. The processor completed the Cinebench benchmark's multi-thread tests at 2.6 to 2.8 GHz, and the single-thread tests at 2.8 to 3.1 GHz. The latter was true in battery mode as well. The CPU completed the multi-thread tests at 2.2 to 2.3 GHz in battery mode. A quick solid state drive and a potent Core i7 processor make for a fast and stable system. Windows starts up quickly. The results in the PCMark benchmark are very good. Toshiba outfitted our test device with their own solid state drive. The SSD has a capacity of 256 GB. The drive's sequential transfer rates are as good as you'll find anywhere today. The 4K write and read speeds, however, are significantly slower than those of a top model like the Samsung 840 Evo SSD. Note: In the table below, there are notebooks that don't form a part of the Satellite's competition. These devices are listed to help draw comparisons between solid state drives. Together, the HD Graphics 4400 and Radeon R7 M260 graphics cores form a switchable graphics solution (Enduro). Intel's integrated GPU is responsible for everyday tasks and all functions in battery mode, while AMD's Radeon chip takes care of programs that have higher performance demands, like computer games. As a general rule, the system switches between graphics cores automatically. On occasion, the user has to make manual adjustments here. 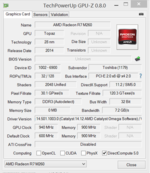 The Radeon R7 M260 GPU hails from the lower mid-range class of graphics cores. It supports DirectX 11.2 and runs at speeds of up to 940 MHz. The results in the 3D Mark benchmark are more or less on par with those of similarly outfitted computers, like the notebook's sister model, the Satellite L50-B-182. In terms of performance, the results rank the core between the GeForce 825M and GeForce 830M. The Satellite is capable of rendering computer games fluidly. As a general rule, the notebook is only able to run current games from the second half of 2014 at low resolution and low quality settings. When it comes to older games or games with only moderate hardware demands, more is possible. Even so, the display's Full HD resolution can only be used for a few games. While the results the Radeon R7 M260 graphics core delivered in the 3DMark benchmark tests rank it between the GeForce 825M and GeForce 830M cores, in practice, the GPU sometimes has a harder time rendering games than the GeForce 820M. All in all, the device's gaming performance is rather feeble for a 900-Euro notebook (~$1100). There are certainly machines that offer better performance in this price range. For example, the Acer Aspire V 15 Nitro is equipped with a GeForce GTX 850M core, and it starts at just 800 Euros (~$978). But notebooks with better gaming performance are available for considerably less, too. The HP Pavilion 15-p008ng, for instance, is outfitted with a GeForce 840M graphics core and a matte, Full HD display -- currently at a starting price of 580 Euros (~$709). In idle mode, the Satellite doesn't make a peep. The fan stands still. As soon as the computer is under load, the fan starts up. It generates a sound pressure level of up to 41.7 dB (stress test). This is a normal number for an all-round multimedia notebook. The fan only produces a constant whirring sound -- no bothersome chirping, whistling or buzzing sounds here. The Satellite in the stress test. The Satellite completed the stress test (Prime95 and Furmark running simultaneously for at least an hour) in the same way in both AC power mode and battery mode. The processor ran at between 2.5 and 2.6 GHz, while the graphics core started the test at full speed (940 MHz). 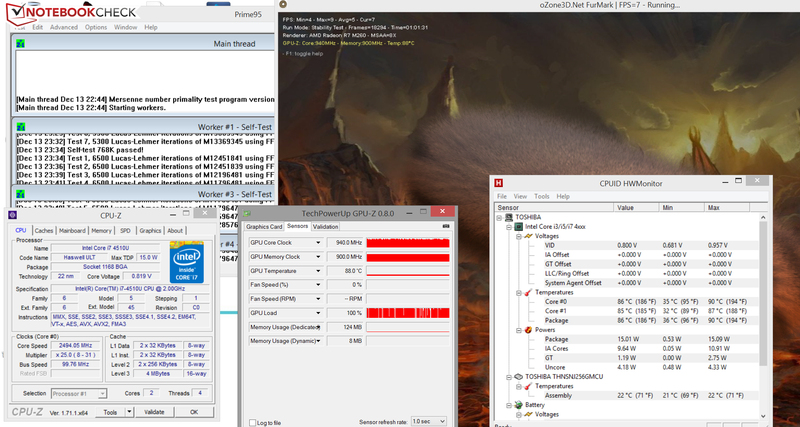 After about 20 to 30 minutes, the GPU's speed began to fluctuate between 870 and 940 MHz. During the stress test, the Satellite warmed up substantially in the area of the cooling element. We measured a temperature of over 50 °C (122 °F) in one spot on the underside of the device. As a result, the notebook should not rest on your lap under this level of load. In normal, everyday use, however, the machine hardly warms up at all. (+) In idle usage, the average temperature for the upper side is 25.1 °C / 77 F, compared to the device average of 30.9 °C / 88 F.
In terms of energy consumption, the Satellite behaves as we would expect. In idle mode, the computer's power usage remains under 10 Watts. The same is true of most Haswell ULV notebooks. Under load, the Toshiba computer's energy consumption rate rises to up to 56.4 Watts -- also a normal number for a notebook outfitted with this hardware. Competitors like the Dell Inspiron 15-5547 and the HP Pavilion 15-p008ng are more or less on par with our review device in this discipline. In our WLAN test, which is designed to simulate practical, everyday use, a script automatically loads a new webpage every 40 seconds. The energy-saving profile is active, and the display brightness is set to about 150 cd/m². The Satellite ran for 5:28 h in this test. This is a good runtime for an all-round multimedia notebook. The Toshiba Satellite L50-B-1TD offers very good application performance and can render many computer games fluidly -- though not current titles. This isn't a computer for serious gamers. The quick solid state drive makes for a fast system. Additionally, the notebook usually runs quietly and its battery life is good. A bright Full HD IPS display completes the package. But at almost 900 Euros (~$1100), the Satellite isn't exactly a budget device. The Core i7 processor and solid state drive jack up the price. If you can live without those two luxuries, a version of the notebook with a Core i5 processor and a 1 TB hard drive is available at a price starting at 600 Euros (~$733) without a Windows operating system. But in the 600-Euro (~$733) price range, there are other devices with better performance. Once again, if you're in the market for a similar notebook, we recommend taking a look at the HP Pavilion 15-p008ng with its GeForce 840M graphics core and matte Full HD display. It costs about 580 Euros (~$709), including Windows 8.1, and it offers better gaming performance than the Satellite. 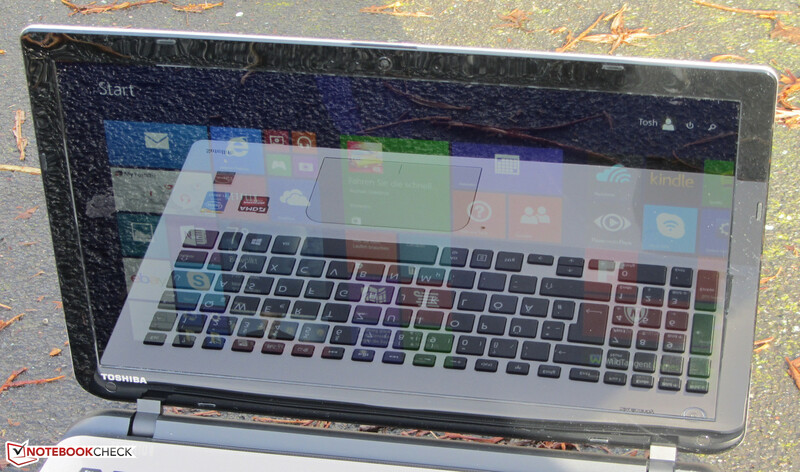 In review: Toshiba Satellite L50-B-1TD. The IPS display, the good battery life, and the silent operation in idle mode. Toshiba is asking a pretty penny for the notebook. Subtract 100 to 200 Euros (~$122 to ~$244) and the price would be more appropriate. Acer Aspire V3-572PG-604M, Dell Inspiron 15-5547, HP Pavilion 15-p008ng, Lenovo IdeaPad Z50-75, Asus X555LN-XO112H, Acer Aspire V5-573G, Acer Aspire E5-551G-F1EW.